The number of inmates in the U.S. has also gone down in recent years, though not as sharply as the incarceration rate (which takes population change into account). The estimated 2,162,400 inmates who were in prison or jail at the end of 2016 were the fewest since 2004, when there were 2,136,600 inmates. The prison and jail population peaked in 2008 at 2,310,300. A variety of factors help explain why U.S. incarceration trends have been on a downward trajectory. Crime rates have declined sharply in recent decades despite an uptick in the violent crime rate between 2014 and 2016, according to FBI data. As crime has declined, so have arrests: The nationwide arrest rate has fallen steadily in recent years and is well below where it was in the 1990s, according to BJS. Changes in prosecution and judicial sentencing patterns, as well as criminal laws, also may play a role in the declining number and share of people behind bars. Recent reductions in prison sentences for thousands of inmates who were serving time for drug-related crimes, for example, have driven a substantial decline in the federal prison population. That, in turn, has contributed to the broader decline in the overall incarcerated population. 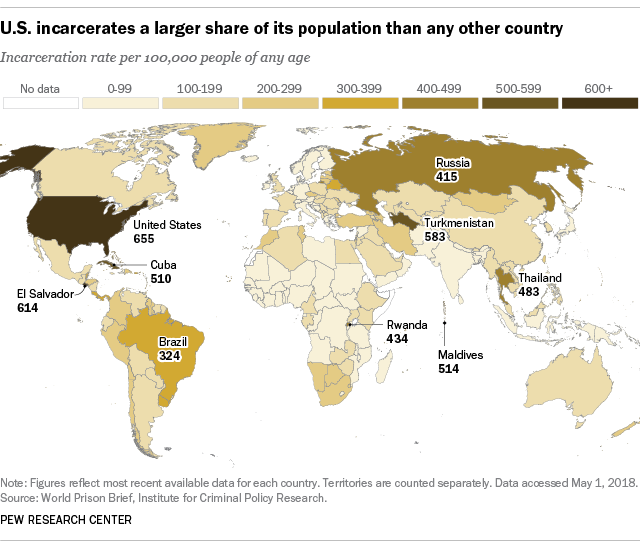 The World Prison Brief’s data put the U.S. incarceration rate at 655 inmates per 100,000 people, which is nearly 7% higher than the rate of the next-closest country, El Salvador (614 inmates per 100,000 people), and far higher than the rates of other heavily populated nations, including Russia (415 inmates per 100,000 people) and Brazil (324 per 100,000). Incarceration rates in Western Europe are less than a quarter of the U.S. rate: In England and Wales, there are 142 inmates for every 100,000 people, while France and Germany incarcerate 102 and 77 people, respectively, for every 100,000 residents. In addition to its high rate of incarceration, the U.S. also has the largest overall number of people behind bars. The more than 2 million jail and prison inmates in the U.S. are far more than are reported in China (approximately 1.6 million inmates) and Brazil (about 673,000 inmates). In China and some other countries, however, data limitations make direct comparisons with the U.S. tricky. The World Prison Brief notes, for instance, that China’s total excludes inmates being held in “administrative detention” – a type of confinement that may house more than 650,000 additional people. Adding an additional 650,000 inmates to China’s total would place it ahead of the U.S. in terms of total incarcerated population.